With the opening day of the farmers market comes the first Market Menu at Eva. A 3 course meal created each weekend, this menu highlights the best the market has to offer. The best part.... it comes with dessert! This week I set my sights on Rhubarb. This long slender stalk looks a bit like celery, but for the iridescence red sheen to it's skin. While the raw texture has a wonderful crunch to it, the tart flavor dissuades us from eating it that way. A lot of sugar and a little heat turn this sour, fibrous stalk into a tender, fragrant addition to dessert. For the Market Menu, I shaved pieces of rhubarb and poached them with a vanilla bean syrup. Rather than submerging the vegetable in a simmering liquid, I brought the syrup to a boil, and poured it over the rhubarb. By letting it steep in the sweet liquid, releasing it's own juices while the temperature slowly dropped, the Rhubarb retains some of it's crisp texture which is so often diminished to mush by heat. These sheets of tender rhubarb sat aside a vanilla crepe cake with a healthy dollop of cinnamon whipped cream. By simply layering crepes with vanilla whipped cream, a stunning 20 layer cake can be made. 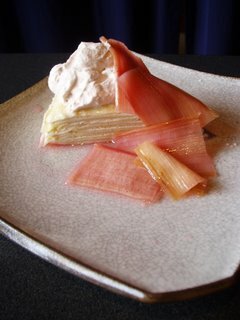 The vanilla crepe cake is accented with a cinnamon cream on top to compliment the fragrant sweet-tart rhubarb and add richness to the crepes. 1. Trim the ends off the rhubarb and cut into 2 inch segments. With a very sharp knife, or a mandolin, carefully slice the pieces into thin sheets. Place the rhubarb pieces in a bowl and set aside. 2. Slice the vanilla bean in half lengthwise, and carefully scrape the seeds into the sugar. With your fingertips, rub the vanilla seeds into the sugar, using the grains of sugar to break the seeds apart. 3. Combine the vanilla sugar, the vanilla pod, and the water in a medium saucepan, and bring to a boil. When the syrup comes to a rolling boil, pour it over the rhubarb. 4. Cover the surface with a layer of paper towels to ensure the syrup completely envelopes the rhubarb. Let sit for 3 hours. Transfer to the refrigerator and chill. Store overnight, or up to 2 weeks. The flavor improves with time. My favorite rubarb treatment is still the way my grandma served it, raw with a bowl of salt for the dipping. That sure is pretty! I like to call it a crepe stack. I make them after farmers market when I have leftover batter from selling crepes on my food cart. I usually layer them with whipped cream and pear butter but I may try your version this week. its really hard to get unblemished and still firm rhubarbs here in Singapore. I used to have this wonderful strawberry rhubarb crumble in an american style deli restaurant in town.. but even they took it off the menu. sigh. Chefrico- that sounds like the umabushi (sp?) plum, super sour and salty! You are braver than I.
Lee- the pear butter sounds delicious. I know next time I make the stack, I will add much more cream, and possibly something more flavorful like a puree of fruit, or nutella. Chaz- Alas, no rhubarb? I'll sigh with you. Very pretty and elegant dessert! Your presentation is beautiful! 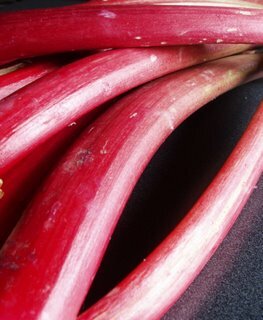 I love the way you've sliced the rhubarb...did you use a knife..or a y-peeler? Anita- thanks for the nice complment! thank you for working hard to keep the inherent personality of rhubarb. 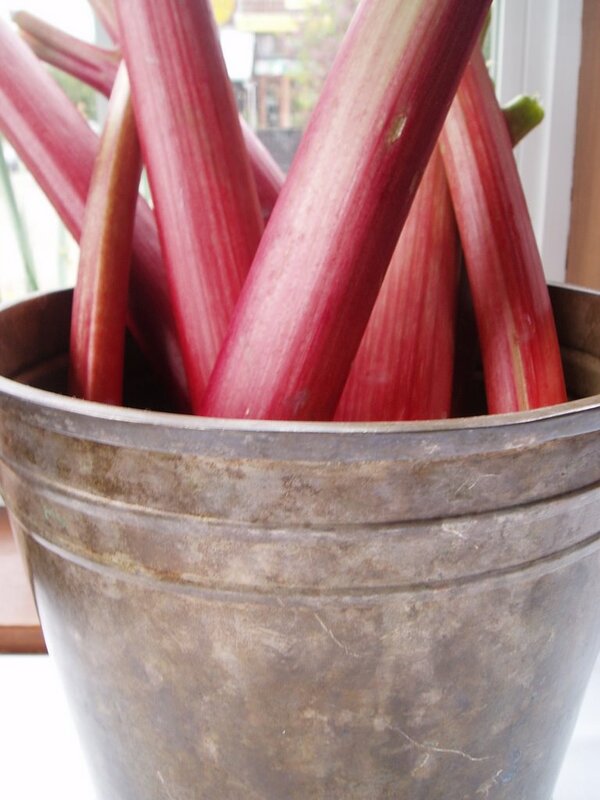 email me with your mailing address-- I have just written a huge article about rhubarb for Edible San Francisco. Yes, your plating here is sumptuous and elegant! Shuna- Will, do! I can't wait to read it. And I concur, yeah rhubarb! Bill- It just so happens I learned this treatment of Rhubarb from Tyler! Thanks so much for that.